Regional Brands is our largest revenue contributor and is a widely diverse portfolio predominantly comprising domestic brands in the Sub-Saharan Africa, Australasia and Latin America territories. Our key focus is on emerging markets where we hold strong in-country positions. 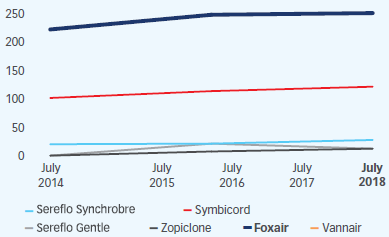 The organic growth opportunity for this portfolio lies in volume expansion within branded prescription medicines, OTC franchises and consumer brands. We continue to enhance our regional portfolio in line with local therapeutic strengths and value propositions. Regional Brands revenue grew 5% to R14 336 million. Growth was largely driven by Emerging markets which contributed 69% to revenue and grew 10%. Developed markets revenue declined 5% in spite of a positive performance in Australasia which makes up the largest component of Developed markets revenue. Revenue in Australasia grew 2%, mainly driven by a 10% growth in OTC revenue. 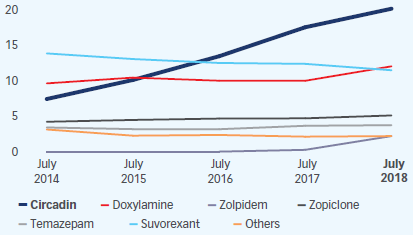 Prescription revenue grew 1%; a solid performance in the face of continued price erosion under Australia’s price disclosure regulations. The Australian business continues to reshape its portfolio to focus on value-adding brands. The revenue decline in the rest of the Developed markets was largely due to HPC in the United States. We entered into a supply and distribution agreement with Mylan for HPC in the United States which resulted in revenue of R398 million being recognised in the first half of the 2017 financial year. There have been no further material sales of HPC and we are currently awaiting feedback from the US FDA following the submission of an ANDA for a preservative free single dose vial. Excluding the non-recurring HPC revenue, Developed markets revenue grew 5% for the period. Emerging markets revenue grew 10% and was driven by performance in South Africa. Revenue in South Africa grew 12% to R7 165 million. The OTC segment grew 17% while prescription revenue increased by 10%. Mybulen continues to be our leading product in the OTC segment. We have maintained our ranking as the number one rated pharmaceutical company in the South African private market with six out of the top twenty-five private sector brands belonging to Aspen. The rest of SSA recorded flat growth for the period. Revenue growth in SSA was up 9% excluding the impact of the termination of our collaboration agreement with GSK. Revenue growth in Latin America was supported by the first half inclusion of products acquired as part of a commercial partnership with Takeda as well as a small product acquisition from Bristol-Myers Squibb. Our ANDA application for HPC in the United States has progressed to a priority review and we anticipate that we will be able to launch our preservative free product in the second half of the 2019 financial year. We have a strong domestic brands pipeline made up of intellectual property that we own and licence. We expect continued volume growth in South Africa through the execution of various commercial strategies including launches of new products aligned with commercial objectives. We are engaging with regulators in South Africa on the low single exit price (“SEP”) granted in December 2017 given the unfavourable exchange rate movements. Australia remains a strategic region for us which has delivered sustained growth. The continued price cuts in Australia mean that we need to continuously assess and refine our business model in order to protect market share. Latin America is set to continue to deliver growth driven by our broad portfolio of intellectual property.